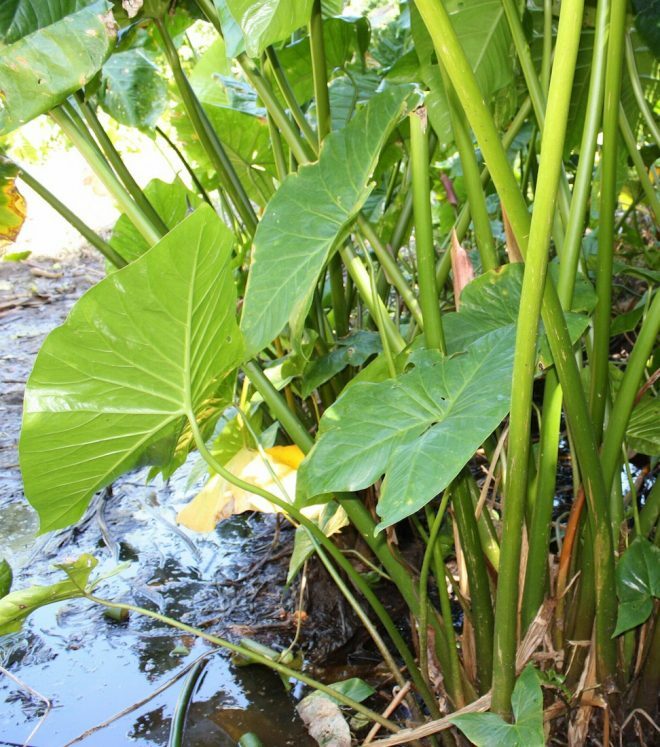 The major aroids comprise taro (Colocasia esculenta (L.) Schott), Xanthosoma species and swamp taro (Cyrtosperma merkusii (Hassk.) Schott), syn. C. chamissonis (Schott) Merr.). Taro (Colocasia esculenta) is grown for its corm and leaves. It is an ancient crop from north-eastern India with multiple centres of domestication. A wild form, C. esculenta var. aquatilis, is the progenitor of the cultivars grown today, including those in the Pacific. It was introduced to Africa early on. Two botanical varieties have been recognized: C. esculenta var. esculenta, commonly known as dasheen, and C. esculenta var. antiquorum, known as eddoe. Pan-tropical dasheens have large central corms and suckers or stolons from which they are regenerated. Eddoes are more common at temperate latitudes and higher altitudes, with relatively small central corms and numerous cormels, but can also be propagated from suckers in tropical countries. Intermediate types also exist. Xanthosoma is an important pan-tropical crop, with its centre of origin possibly in northern South America. From there, Xanthosoma was introduced to West Africa, Oceania and Asia. There are two main species, X. sagittifolium and X. violaceum, but the taxonomic position of the cultivated Xanthosoma species is unclear; the name X. sagittifolium is often given to all cultivated forms. Xanthosoma is vegetatively propagated from corm setts, headsetts or cormels. Although flowers occur and seeds are viable, flowers are rare in most varieties and non-existent in some. In addition, seedlings may not breed true and hence are not recommended for regeneration. Cyrtosperma merkusii (swamp taro) is the only edible form of its genus. Unlike taro and Xanthosoma, the leaves are not eaten although they may be used as medicines and for making fine-grade mats. Cyrtosperma is thought to have an Indo-Malay centre of origin, perhaps coastal New Guinea, Solomon Islands or West Melanesia. Wild-type plants are said to occur in the Solomon Islands. Cyrtosperma is vegetatively propagated from setts or suckers. Flowers and seed do occur but are not common and are not recommended for regeneration. Genetic resources of edible aroids are conserved through vegetative propagation. It is good practice to establish a duplicate field collection as a back-up. Methods for cultivating and propagating aroids are not well documented but extensive local knowledge exists. The largest genebank collection of edible aroids is held by Centre for Pacific Crops and Trees in Fiji.